made me go hmmm, and then pray for some! I’m working on a talk/training/resourcing time we are doing for our STINTers/Volunteer next week, tentatively entitled “Cultural Landmarks and ‘Avenues’ to the Heart of Czechs“, and I found this quote in one of my favorite commentaries about Czech history, legends, and life. It is an amazing quote! 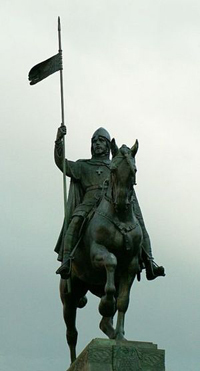 Especially, when you consider that King Wenceslas is a major Czech hero and considered the patron saint of the Czech lands, come on the biggest square in the city is Václavské námestí (Wenceslas Square). So as I read and reread the quote on the tram home, I prayed that God would raise up Czechs in the same vain as this quote. Would you join me in praying for this? How beautiful of a picture does this quote paint? Well, imagine the Lord painting a much more brilliant picture if there were Czechs living this out boldly today! I love the church-plant hint that is in the quote too – “Building churches in all castles”! I guess, we aren’t building them in castles anymore, but it’s still there! May God increase His worship in this great nation! Thanks for stopping by, I’m off to bed! That is an amazing quote. I knew he had significant role in bringing Christianity to the Czechs, but wow! It encourages me to pray to see that again. Just wondering if you had any suggestions on anything I could read about Czech Republic and there culture to help with moving there?